Radar, a 2-year-old French Bulldog, came in for his yearly special treat: a birthday cake, a black collar with rhinestones and a grey shirt that read “Stud,” which was meant to impress his girlfriend, Kona, a 1-year-old Brindle French Bulldog. Radar was attentive to the people and things around him, with his ears pointed straight up and his eyes ogling the toys and people coming into the store. Fetch Dog Boutique and Bakery, in Port Jefferson, which opened in 2005, has a list of regulars, but its owners don’t advertise. People learn about the store through word of mouth and recommendations from friends and family. 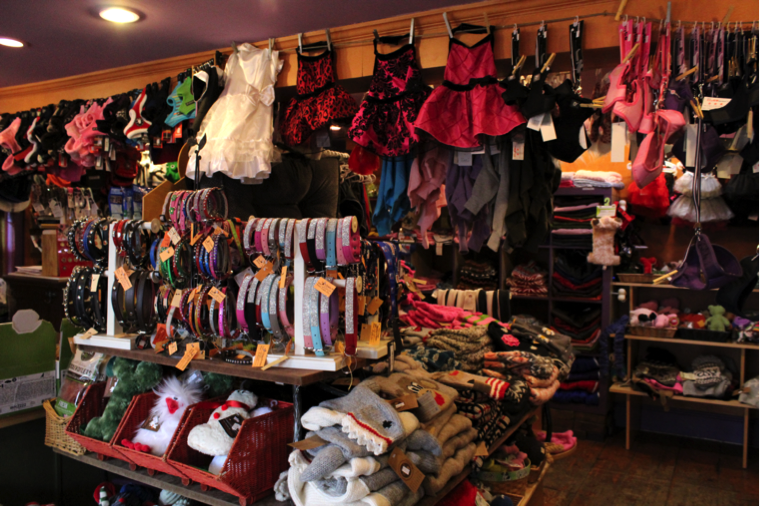 The store has clothes — which change seasonally — for dogs and cats ranging from 1 to 120 pounds. Every year, the store sponsors a Halloween pet parade that fills the streets of Port Jefferson with pets in costumes. “You can go to Petco and things like that, but they have everything here,” Smith said. Pattie Lurz runs the store behind a clear counter filled with baked goods for pets. The bakery changes by holiday and sells dog treats, birthday and wedding cakes. Lurz occasionally goes upstairs to pick up dog food samples from specialty brands for picky pets to try out and feeds them treats from the bakery until they are satisfied, or sends some treats home for the dogs to eat later. A troubled Maltese owner, Stephanie Boder, brought her friendly 5-year-old dog Macie into the store because she was told that she could get advice on feeding her. Macie, who was squealing around the store, is a spoiled dog who got into the bad habit of solely eating bones and snacks. “It’s frustrating. She won’t eat at all,” Boder said. Lurz gave Boder suggestions on how to get Macie to eat normally again., offering several kibble samples of Anna met Dog Food and Fromm Four-Star Nutritionals, as well as some wet food and human food suggestions. Lurz was looking for a happy medium for Macie, who also enjoys human food like waffles and chicken. Weir used to sit in a chair in the corner of the store with Sophie, his Cavalier King Charles Spaniel, on his lap while his wife spoke with Lurz. As the store needed more space, the chair was taken away, but Weir still longed for it. “My house looks like the store,” Weir said. He just left the store and was already planning on coming back next week to pick up more treats for his three Cavaliers.